On 21st May 1941 the 'Sky Soldiers' came to Nikolaos' home island of Crete. This is Nikolaos' story. He tells of how the Allied soldiers who helped the people of Crete were greatly under-resourced in terms of equipment, and how he and the people of his village helped Allied soldi... read full description below. On 21 May 1941 the sky soldiers came to Nikolaos- home island of Crete. 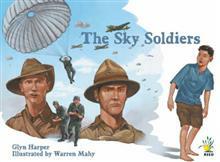 The sky soldiers were German soldiers who jumped out from their aeroplanes. They were wearing parachutes and floated slowly down to earth. The sky was soon full of German soldiers floating to earth. Even though I felt afraid I couldn't help staring at the men in the sky. This is Nikolaos' story. He tells of how the Allied soldiers who helped the people of Crete were greatly under-resourced in terms of equipment, and how he and the people of his village helped Allied soldiers hide and evade the German soldiers. There are scary times; when Nikolaos and his sister, Maria, guide a New Zealand and Australian soldier to an escape point and they must hide from German soldiers and their fierce dogs. There are sad times; at the end of the war the surviving village recruits return from their duties, but there are also those who don't return that are mourned. And, there are happy times; where a connection between Nikolaos and New Zealand is firmly established when one New Zealand soldier returns to the village to thank the people for helping him to escape, and asks Maria to marry him.